Home » Featured » News & Updates » Are You Ready for Spring Break 2014?! Are You Ready for Spring Break 2014?! Spring Break is the largest student event of the year, as over 1.5 million students from across the U.S. travel to various destinations, the most popular being Panama City Beach, Florida. Known as the “Spring Break Capital of the World”, Panama City Beach has annual attendance numbers exceeding half a million students, making it the most attended Spring Break destination in the world. One thing is for certain, you won’t leave PCB without at least taking 10 pictures of the sun setting over the gulf. Whether you want to admit it or not, you know it’s a pretty spectacular sight, and sharing those perfect golden images on our Facebook and Twitter profiles are the very things that make our friends and family back home envious of us. 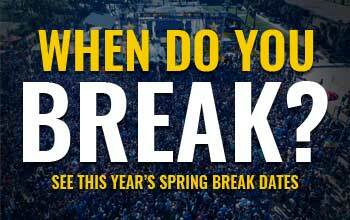 Each year, the free concerts are a huge talking point during Spring Break. Last year, crowd favorites Luke Bryan and Florida Georgia Line packed the beach from east to west. We’ve seen Kenny Chesney, Flo Rida, Lil’ Wayne and Drake all perform to massive crowds. One of the best guarded secrets each year is simply who will be next? Whether you’re planning to travel by car, bus, or plane, Panama City Beach’s North-West Florida location makes this a very accessible place to travel to. It’s no wonder that the mid-west and eastern states make PCB their primary travel spot each year. Panama City Beach may be recognized around the world for its beaches, but equal due should be paid for its variety of eateries and the fresh food that they serve. If you love seafood, then you’ll have a great time trying to choose where to go. If a juicy steak is what you crave, there are plenty of terrific places to serve you. Love Asian cuisine, Mexican, or Italian? Rest-assured, you’ll be well taken care of. Please click here for more information on where you can eat while in PCB. With Pier Park’s location right off the main strip, there’s really no need to go anywhere else. But if variety is what you require, then crossing the bridge over into Panama City to hit the mall is a popular option. And for those who know a thing or two about Destin and its available shopping, you know it’s a whole different world out there – even if it is only just 45 minutes away from the beach. Please click here for more information about Shopping in PCB. Swimming and tanning not withstanding, there are a variety of activities one can choose from to make each and every beach day a fun one. Whether it’s Parasailing over the gulf, swimming with the dolphins, zip-lining along the beach, or entering one of the many daily free volleyball tournaments, you’re completely covered!